Catholic News World : Korean Church Promotes Prayer Campaign for Peace "For true reconciliation, what we must do is pray." Korean Church Promotes Prayer Campaign for Peace "For true reconciliation, what we must do is pray." Seoul (Agenzia Fides) - "For true reconciliation, what we must do is pray. Let us invoke Mary, Queen of Peace, so that through her intercession sincere reconciliation can be achieved, overcoming the horrible pains and memories of the war, and the flame of faith in North Korea is rekindled as soon as possible": this is how Fr. Kim Nam-woong, a young priest of Seoul ordained in 2018, and parish priest in the church of Hwayangdong, addressed the faithful who crowded the Cathedral of Mary Immaculate, in Seoul, gathered for the 1170th "Mass for peace and reconciliation", organized by the "Committee for the Reconciliation of the Korean People" of the Archdiocese of Seoul, and concelebrated by Fr. Kim Hun-il, Political Director of the Committee. The first "Mass for peace and reconciliation" was celebrated in March 1995, presided over by Cardinal Kim Su-hwan and, since then, all those who want to remember and pray for the Church in North Korea meet in the Cathedral of Seoul every Tuesday. Every week, during the Mass we remember, in particular 2 of the 57 parishes that existed in North Korea. In the Mass celebrated on Tuesday, June 26th, the intentions of prayer were dedicated to the parishes of Daeshinri and Gwanhuri of the diocese of Pyongyang. As a concluding hymn, the participants sang "Our desire is unification", a song with which the Korean people sincerely pray for the unification between North and South Korea, followed by the "Prayer for Peace" attributed to St. Francis of Assisi . As Fr. Kim Hun-il tells Fides, "the decision to celebrate a mass or a moment of prayer together for peace and unity was taken on August 15th 1995 in a meeting between the Committee for Reconciliation of the Korean People in South Korea and the "Catholic Association of Chosun", which unites the Catholics of North Korea, an organism officially recognized by the government of Pyongyang. Since then, noted Fr. 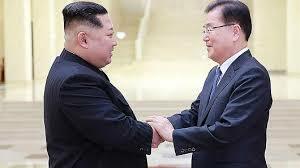 Kim, "believers in North and South Korea pray simultaneously, in spiritual communion, maintaining a bond". Currently the "Committee for the Reconciliation of the Korean People" has launched a special campaign called "The Church in North Korea is in my heart": the faithful commit themselves to reciting a prayer for the Church in North Korea every morning and evening, and to attend at least two Masses for peace and reconciliation a year. In addition, they take part in voluntary or charitable programs, either regular or occasional.